In the past month, PM Trudeau announced yet another government apology, this time to Canada’s Jews. According to Trudeau, Canada had sinned greatly in 1939 by denying entry to Canada to Jews fleeing Europe aboard the ship St. Louis. According to Trudeau, those Jews were forced to return to Europe and suffer WW2’s Holocaust. Before issuing any other apologies, Trudeau should do some important research. The family of Rosalie Abella, one of the judges on Canada’s present Supreme Court, survived the Holocaust and migrated to Canada after World War 2. 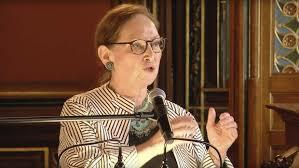 In the mid-1980’s, ironically, Rosalie Abella , in a campaign of arrogant and sloppy research, released an “Employment Equity” report which ignited a virtual Holocaust within Canada. That Holocaust has destroyed the job-hopes and entire lives of at least hundreds of thousands of Canadians. In fact, the number of victims may well exceed the 6 million figure of Jews killed in Europe. If Canadians are to hear another apology, it should be coming from Canada’s Supreme Court Judge Rosalie Abella and the herd of “Diversity-hiring” promoters she unleashed in Canada’s public and private sectors. If Trudeau is remotely interested in performing his duty to Canadian-born, he should be demanding an apology from Abella and her herd of boot-lickers and should be ending the so-called “Employment Equity” (really “Employment Inequity”) program she started. After that, how about some Canadian-style Nurenberg Trials to deal with Abella and all those who have carried out the alleged “solution”. Dr. Martin Loney’s book, “The Pursuit of Division : Race, Gender and Preferential Hiring” documents in great detail the origins and results of Rosalie Abella’s work. In the following article, he summarizes the origins. The appointment of Rosalie Abella to the Supreme Court has precipitated much celebration among the progressive chattering classes. Globe and Mail correspondent, Michael Valpy, enthused that Abella would bring ‘an unassailable and much needed expertise and vision on equality law’ to the court. Well, not quite “unassailable”. I have spent many years researching and writing on employment equity, the subject of Abella’s 1984 Royal Commission Report. What stands out is how much Abella’s work is driven by feminist ideology and how little it is concerned with evidence. Abella’s 1984 report made sweeping claims about labour market discrimination but found it unnecessary to back them with hard data. According to her report, women’s progress in the labour force was ‘chimerical’; ‘dramatic changes’ were needed to allow women to participate in a full range of educational opportunities. This was a curious conclusion since by 1982 women were already the majority of university graduates and no less than 58 per cent of community college graduates. Today women are 40 per cent more likely to obtain an undergraduate degree than their male counterparts. Much of the report reflects nothing more than the search for any evidence that will support the preconceived conclusion that women and other so-called designated groups experience disadvantage. Feminists see any earnings differentials or disparity in employment as prima facie proof of injustice. What is required in contrast is the careful comparison of those with similar profiles. Comparing the earnings of men and women is meaningless unless we take into account such factors as age, hours worked, qualifications, length of service and type of employment. The Royal Commission preferred instead to make more sweeping comparisons. According to the report, women, in 1982, made a mere 64 per cent of male earnings. However, the report does not say that the rapid change in female labour force participation saw large numbers of young women enter the labour force. To compare their earnings with a group which contains a large number of older men or to claim that their relative absence in senior positions is evidence of discrimination is simply polemics. The inclusion of visible minorities in the Royal Commission’s mandate owed much to the American experience though the marked difference in the history of the two countries should have suggested more careful reflection. In the U.S., affirmative action programs have been driven by the desire to redress the legacy of slavery. Canada, in contrast, had few slaves and largely abolished the institution of slavery by the end of the eighteenth century. The overwhelming majority of visible minorities in Canada are free migrants. It is inconceivable that the U.S would have instituted a costly and divisive preferential hiring program to address the temporary adjustment difficulties of new immigrants, but that is precisely what the Abella report ushered in. The Royal Commission might have urged caution; after all as one of its researchers warned, the absence of any definition of ‘visible minority’ and of related data prevented any assessment of the ‘social indicators of discrimination’. Abella was not to be deterred. Racism, she reported, ‘though sometimes inadvertent, is nevertheless pervasive’. The inadvertent racism was no doubt a fashionable reference to that mysterious virus ‘systemic discrimination’ which remains as widespread as it is ill defined. Pervasive racism must, however, have demonstrable consequences. It must result in visible minorities, with similar characteristics to other Canadians, earning markedly less. If those who have the same educational background, the same years of experience and the same language capacities as other Canadians fare just as well, what need is there for a costly and divisive preferential hiring program? Subsequent analysis of 1986 census data by demographer Monica Boyd, an avowed feminist, found little difference in earnings of Canadian-born visible minorities and other Canadian-born workers. The famously “doubly-disadvantaged visible minority women” earned a little more than their singly-disadvantaged sisters; visible minority men earned an insignificant amount less. A later analysis of Statistics Canada data by University of Manitoba economists Hum and Simpson also found little difference in the earnings of Canadian-born visible minorities. Such findings have been ignored. The Abella report fuelled a growing industry of diversity trainers, preferential hirers, anti-harassment officers and others whose occupational success means the endless search for yet more evidence of discrimination. Canadian universities were hijacked by radical feminists who used federal employment equity legislation to hire others who shared their biology and ideology. Today, qualified women are twice as likely to secure academic appointment as their male competitors. Abella will bring to the Supreme Court a vision of equality rights rooted not in careful analysis, but radical feminism. To Abella, as she made clear in a later essay, equality does not mean being ‘chained to the civil libertarian pedestal of equal treatment of every individual’. Those with a prior claim of victim status (however dubious) are entitled to be treated differently and advantageously. This is the philosophy that Abella will bring to her new job, one that offers little chance of justice to those with no claim on the feminist conscience. Martin Loney is the Author of “The Pursuit of Division: Race, Gender and Preferential Hiring in Canada” (McGill-Queen’s University Press-1998).